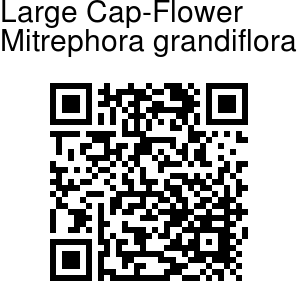 Large Cap-Flower is a small tree, up to 12 m tall. Flowers are borne singly or 2-3 in leaf opposed cymes, flower-stalks about1 cm long, velvet-hairy. Petals are white to yellow, sepals 3, densely woolly, fused at base, broadly ovate or round 4-5 mm across, yellowish-brown velvet-hairy. Petals are 6 (3+3), outer petals 3 x 2 cm, obovate-pointed, white, turning yellow, velvet-hairy outside, nearly hairless inside. Inner petals are 1-1.5 x 0.3-0.5 cm, dissimilar to the outer ones, forming a cap over the stamens and carpels. Branchlets are minutely rusty velvet-hairy. Leaves are simple, alternate, distichous; leaf-stalk up to 0.6-1.3 cm long, channeled; rusty velvet-hairy. Leaves are 8-16 x 3.5-6.7 cm ovate to elliptic, tip tapering with blunt end, base narrow to rounded, margin entire, leathery, dark green above, hairless; domatia hairy at axils of secondary nerves; secondary nerves 6-8 pairs, prominent; tertiary and higher order nerves netveined. Clustered 1-2 seeded berries are spherical, woolly. 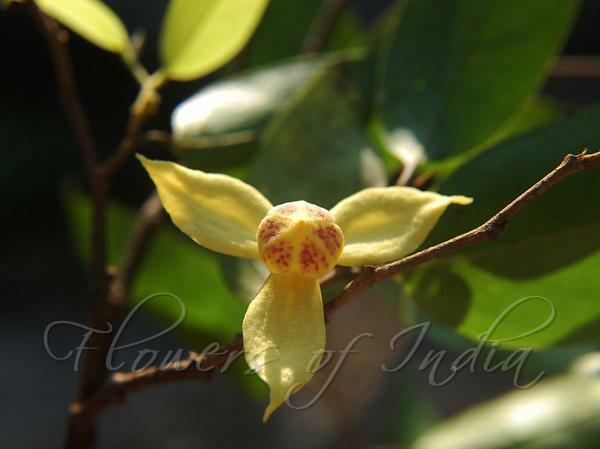 Large Cap-Flower is endemic to the Western Ghats, mostly in Southern Western Ghats. Flowering: January-April.